While it is true that we have spectacular beaches on Hilton Head Island loved by locals and visitors alike, summers here in the Lowcountry offer so much more. Let’s look at some things that make life especially fun during the warm summer season. We are fortunate to be surrounded by rivers, estuaries and sounds which provide amazing beauty and wildlife. Kayaking is a relaxing way to see nature at its best on and off island. You can join some group activities or head off on your own to discover astounding wildlife and spectacular colors throughout the day. Sailing is an excellent choice whether you are a seasoned sailor or new to the experience. The South Carolina Yacht Club offers sailing lessons and camps for kids, designed for their age and skill level. There are also adult classes, so it is never too early or too late to discover the fun and engaging social life that evolves around the sport. Regattas are social events held by local clubs and many are designed around amateur sailing competitions. The boats are classed according to size and type. While perhaps there are some bragging rights to winners, the local events are built around comradery and love of sport. Paddle boarding is another water sport for families. If you are a first timer, try Shelter Cove or South Beach in Sea Pines to get started. If you are experienced, give standup paddleboard (SUP) yoga a chance. Prerequisites are basic. Yoga requires breathing and focus. To add the paddle board, you must be able to stand on one foot. Seems easy enough. Slow down, breathe, be aware of the center of the paddleboard, and gaze at the horizon for stability. Let me know how you are doing. Think I will just have to rely on your experiences. 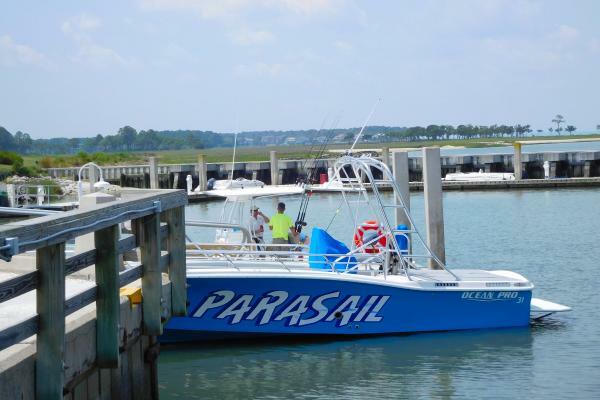 Parasailing is another way to enjoy a day on the water. Whether you go alone or buddy up with your best friend, it will be time well spent enjoying a summer day. For those who are more comfortable on the water than above, try tubing for some cool entertainment. If fishing is your line, you won’t be disappointed in and around Hilton Head and Bluffton. You can fish off a dock or join a captain on a boat, and just about everything in between. There are some accomplished guides ready to help you have a great fishing experience, no matter the size of the catch. No experience necessary. Don’t forget, even the youngest of children love to go crabbing. All you need is an inexpensive trap, some fairly, ripe chicken and an enthusiastic child. If you want to be a bit more adventurous, you can tie a piece of chicken to a string and try your luck that way. Our family always enjoyed crabbing at South Beach and off Port Royal Sound beaches, but there are many other equally good places to try your luck. Hilton Head boasts a new rowing center off Squire Pope Road. Rowing is a very demanding sport and requires both muscular strength and cardiovascular endurance. For competition, teamwork is extremely important. The youth program on Hilton Head is very successful and includes 7th – 12th grade students from Beaufort and Jasper Counties. They compete in regattas all over the Southeast. No, this isn’t just for kids. There are groups of adult rowers who love the social element and challenging exercise it offers. Jet skiing can be an exciting time on the water. There are rentals available, but if you bring your own, there are many convenient launch sites. There are numerous boating trips available, too. Outside Hilton Head offers a variety of them. Find one that matches your family’s interests and endurance. Other companies provide dolphin tours, shrimp boating experiences and even boats you can rent to explore and discover on your own.